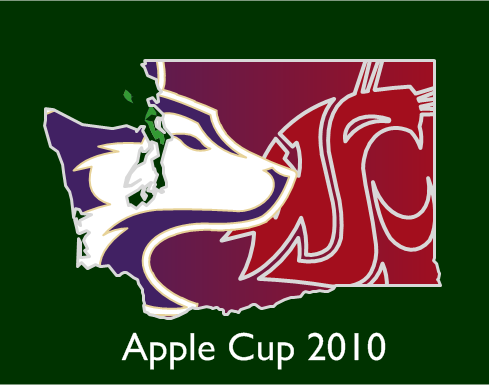 Update Nov. 25th, 2016: The most “important” Apple Cup in a long, long time. 5th ranked Washington vs. #23 Washington State. WHOA NELLY! Update Dec. 29 2010: The Huskies have weaseled their way into a bowl game, a rematch with Nebraska today. It’s rivalry weekend, and that means WA bragging rights are up for grabs. Let’s start off with some music! 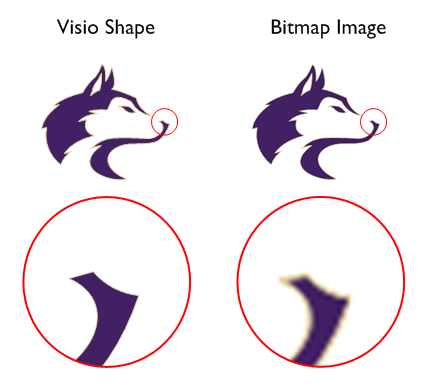 Get your Visio logo shapes for the University of Washington Huskies and Washington State Cougars and put your creativity to work bugging your coworkers! December’s cold and dark has settled in, but one last apple has yet to be harvested. On Saturday, fans in Crimson and Gray and Purple and Gold will descend upon a chilly Palouse, to bid adieu to the 2010 college football season. For Washington and Washington State football fans, this year’s Apple Cup is being played later than it has in 110 years. Pushed to the twelfth month of the year, the temperature at kickoff won’t be more than 27° (-3°C), and a 4pm start time ensures that it’s all down-hill from there. Speaking of downhill, the Cougars have a laughable 2-9 record, and the Huskies are an embarrassing 5-6. Only the heat of cross-state rivalry will keep fans warm this year, as there are no dreams of trips to sunnier places this winter. Which brings us to today’s download! Husky and Cougar logo shapes! If you’re not already on the road to Pullman, there’s no reason you can’t start a war in your office right now…or on Monday after the results are in! 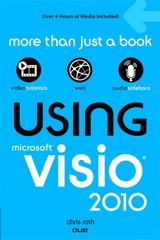 Why Make Visio Logo Shapes? Visio is for creating serious business process flows, network layouts, facilities management office plans, and data-connected diagrams of all kinds, right? Well, yes, but I have several reasons for creating these things. I’m an artist stuck in the body of someone who needs to earn a living. This is my outlet! Logos are fun! You can add spice and smack-talk to meeting handouts and presentations. The challenge! I enjoy pushing Visio as far as I can, and believe that it can be used to create attractive graphics, given the right techniques and add-ons. Research. I’ve been slowly developing automated tools that make it easier to create graphical shapes. Cool-looking logos are my test bed. It’s Friday, let’s have some fun! I don’t want to turn this article into a treatise, but let’s take a quick look at a few of these points. You can modify native Visio shapes with the formatting, drawing tools and Boolean operations. These examples would hard to create using bitmaps in Visio. You’d have to call your local PhotoShop pro, who probably doesn’t like sports anyway. Visio does support transparent backgrounds of PNG images, but your run-of-the-mill image will often have a rectangular background that is hard to get rid of. Using bitmaps in your presentations can look amateurish. 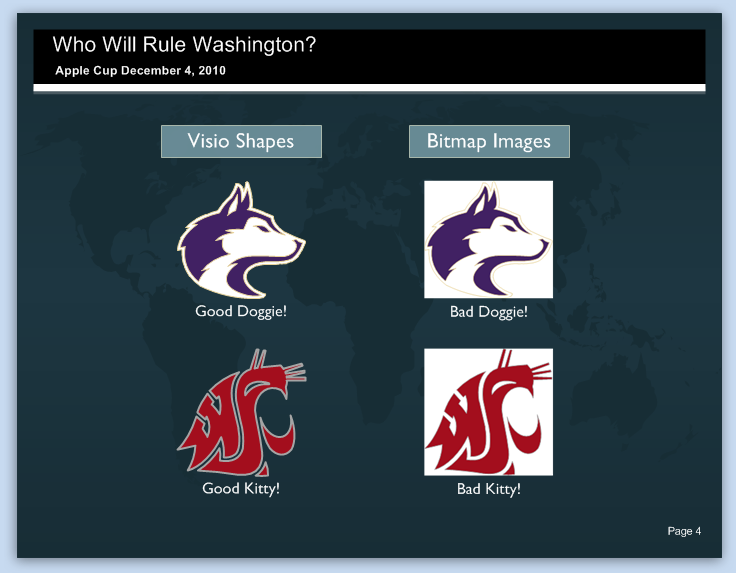 Get your Dawg and Coug Visio Shapes! That wraps-up the serious part of the show. I hope that it was technical enough that you can write-it off as “real work” and personal development. 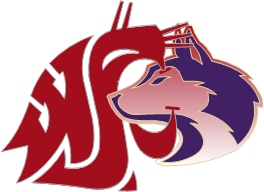 So get your Washington Husky and Washington State Cougar Visio Logo Shapes and have a great weekend! With a Rah! Rah! Rah! Now that the Huskies have won, it looks like they will be going to sunnier places – San Diego to be exact. Man, when I saw that almost fell off my chair. A .500 team goes to a bowl! Hopefully the Huskies can look a bit better against the Huskers this time ’round! Man alive, I hate the Huskies. Who chose their colors, Liberace? THAT’s more like it! Can’t wait ’til November!